(Mr Casino Games®) New Table Games, June-2014. Lucky Draw Baccarat®: Play Live in UK and Australia. Lucky Draw Baccarat® Video Presentation. Roulette Link-Bets®: Play Live in UK. Raies'em® 3-Card Draw: Play Live in UK. Casino Hold'em® for Fun on any device (PC, Tablets, iPad, iPhone and Mobiles). Casino Holdem® (First Texas Hold'em Against the Casino ©2000): Played Live 100+ tables: Europe, Africa, South Africa, Egypt... / (Play Online: 1,000+ Casinos). Casino Hold'em® Free Play (Williamhill / Playtech). Casino Hold’em® Free-play (Net Entertainment). Casino Hold’em® Free-Play (Lottomatica / GTECH-G2). Casino Hold’em®/Caribbean Hold’em™ Free-Play (Bovada / RTG). Casino Hold’em® Demo (Evolution Gaming). Casino Hold’em® How to Play (DEQ). A photo of Derek Webb (Three Card Poker & 21+3) and Me (Stephen Au-Yeung) at the World Gaming Congress and Expo in 2001, with my Casino Hold'em® table. Photo By Ian Sutton (www.Gamingfloor.com). A photo of Casino Hold'em® in Concord Card Casino in 2001. Photo By Ian Sutton (www.Gamingfloor.com). Last edited by MrCasinoGames®; 28th November 2016 at 02:00 AM. (Mr Casino Games®) New Table Games (Part 2). Last edited by MrCasinoGames®; 31st December 2014 at 05:13 PM. Common-Hand Blackjack® First Single-Hand Unlimited-Players and choice Blackjack® Invented in ©2006. The Game is significantly faster with One Common-Hand is dealt which all Players share. Each making his own play decisions. No card will be drawn until all Players have made their play decisions. One split only. No card will be drawn until all Players have made their play decisions. Step 1. All Players make their bets. Step 2. A Common-Hand of two cards is dealt face up and one card is dealt face up to the Dealer. Step 3. Each Player makes a play decision to draw a card, to double down or to stand. If the Player elects to draw a card or double down go to Step 4. If the Player elects to stand go to Step 5. Step 4. Once every Player has made his play decision a third card is dealt face up and will belong to those Players who have elected to draw a card or double down. Players who has double down go to Step 5. If the hand value is below 21 after the third card is exposed, any Player may stand or request a fourth card. The same procedure as in Step 3 (no double down) is followed until all Players stand or bust. Step 5. When the Player stands the value of the hand is recorded on the Blackjack Grid. Step 6. When all Players' play decisions have been executed. The Dealer will burn a card and draws to his hand in the normal way. In the case of split Aces the Common-Hand is complete once the second card is dealt to each Ace. All decide not to split: One non-split hand of two cards (See Fig 1) is played and the hand will be played to completion. All decide to split: Two split hands of one card each (See Fig 2) are played to completion. The original hand no longer exists. Some split – Some don't split: Three Common-Hands are played; one non-split hand of two cards and two split hands of one card each (See Fig 3). Non-split Hand (See Fig 1) is played and completed before dealing with the two new hands created by the split cards (See Fig 2). Last edited by MrCasinoGames®; 28th July 2017 at 02:51 PM. 1. The side bet (Blackjack Block) can be played on any blackjack game. There is no strategy to the side bet (Blackjack Block) so it will not interfere with the blackjack play. 2. The side bet (Blackjack Block) shall win or lose depending only on the player’s initial 2 cards and the dealer’s up card. 3. 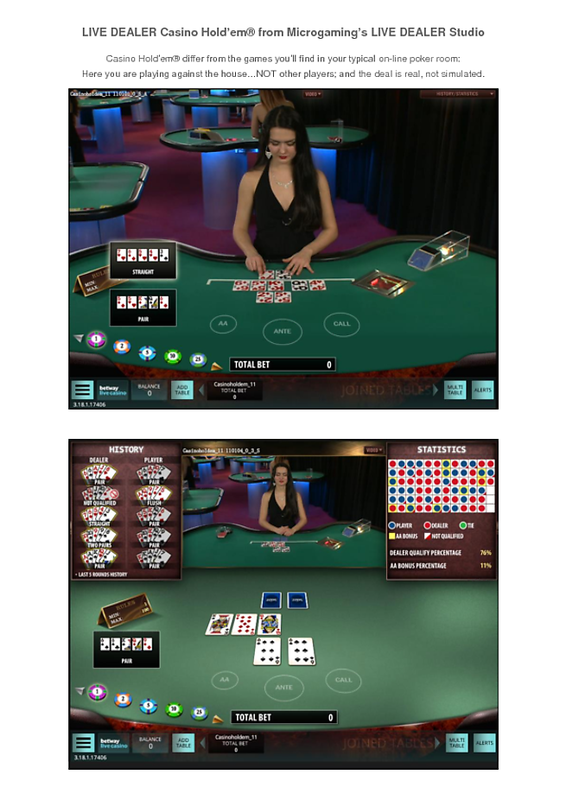 If the player’s cards are different rank and suit, and 1 of them matches the dealer’s suit and exceeds the dealer’s rank the player shall have a “Normal Block” which pays 2 to 1. 4. If the suit of both player cards match the suit of the dealer card, and at least 1 of the player's card exceeds the dealer card in rank, then the player shall have a “Flush Block”, which pays 5 to 1. 5. If the player has an unsuited pair, and 1 of them match the dealer card in suit, and exceed the dealer card in rank, then the player shall have a “Pair Block”, which pays 10 to 1 with 2 or more decks, and 15 to 1 in a single deck game. 6. If the player’s 2 cards are same in both rank and suit, and that suit matches the dealer’s suit, and the player’s rank exceeds the dealer’s rank, then the player shall have a “Ultimate Block” which pays from (35 to 60) to 1, depending on the number of decks. However this win does not apply to a single deck game since it is impossible to have two identical cards in a single deck. 7. If at least 1 of the player cards matches the dealer’s card in both rank and suit, and other card (if any) does not match the dealer’s suit or is less in rank than the dealer’s rank. Then the player shall have a tie, which is a push. Last edited by MrCasinoGames®; 28th July 2017 at 02:54 PM. Roulette-18® is played with a 20-sided die shake in a shaker by a Player. The faces of the die contain the numbers 1 thru 18, and two zeroes (0, and 00). Nine of the numbers are red, nine numbers are black and the two zeroes are green. The double-zero (00) roll is not used in the game, so it’s ignored when it rolls. 1. Players place their bets on the Roulette-18® layout. 2. A Roulette-die is shake in a shaker by a Player then exposed by the Dealer. If the roll is a double-zero (00) all bets remain in action and the die is shake again until a non-00 winning number is determined. 3. Dealer collects all losing bets and pays winning bets according to the Pay-table. © Stephen Au-Yeung. All rights reserved. Last edited by MrCasinoGames®; 6th February 2015 at 08:57 PM. Click here for Video Demo on Roulette-18®. Last edited by MrCasinoGames®; 6th February 2015 at 08:59 PM. Live-Dealer Casino Hold’em® for DENMARK's market, July-2014. I am please to say Live-Dealer Casino Hold’em® is now played in DENMARK's liberalised gaming market, July-2014. Evolution Gaming releases innovated online Live Casino for DanskeLicens Spil in Denmark’s liberalised gaming market. Last edited by MrCasinoGames®; 6th July 2014 at 05:14 AM. Mr Casino Games®: Casino Omaha Poker™ (First Omaha Poker Against the House ©2003) Play in Eastern Europe. Mathematical Analysis = Michael Shackleford, A.S.A. 1. Players make an Ante wager and an optional side bet. 2. Three cards are dealt face down to each player and the dealer, In addition 3 flop (community) cards are dealt face up. The players may examine their own 3 cards but sharing information should be discouraged. All players and dealer may use the 3 flop (community) cards as part of their hand. 3. Each player must decide to either Fold or Call. If the player folds he gives up his cards and his Ante. If the player call the Call bet must be double the Ante. 4. The dealer will then deal 2 more community cards, form a total of 5. The dealer will also turn over his own 3 cards. 5. Each player and the dealer will form the best 5-card poker hand by using exactly 2 of his own 3 cards and 3 of the 5 flop (community) cards. 6. Each player will compare his best hand against the dealers best hand. 7. The dealer must have a pair of 7s or better to qualify. If the dealer does not qualify then the ante will pay according to the AnteWin® Pay-table below and the call bet will push. (a) Dealer beats the player, then the player will lose both the Ante and Call. (b) Player beats the dealer, then the ante will pay according to the AnteWin® Pay-table shown below, and the call bet will pay 1 to 1. 8. If the dealer qualifies and the player ties the dealer then both ante and call bets will push. Last edited by MrCasinoGames®; 17th October 2014 at 07:04 PM. Step 5. When the Player stands the value of the hand is recorded on the Blackjack Grid (as illustrated) [img= http://www.casinoholdempoker.com/CHP...ycombGrid.jpg]. Last edited by MrCasinoGames®; 28th July 2017 at 02:55 PM. (Mr Casino Games®) 4-Suit Poker™ ©2007. Mr Casino Games®: 4-Suit Poker™ ©2007. 1. A single 52-card deck is used. All cards are ranked as in poker. 2. The order of hands is shown in table 1. If both player and dealer have the same ranking hand then the individual cards will be used to determine the higher hand. If a suit is only represented by one card, then obviously that one is played. If a suit is represented by two or more cards then only one suit, resulting in the highest ranking hand, may be played. Other cards of that suit are ignored. 3. Play begins with the player making an ante wager, plus optional side bet. 4. Each player will receive three cards face down, plus one player's community card, also dealt face down. The dealer will receive four cards, three cards face down, and one card face up. The player may look at his own three cards but may not exchange information with other players. 5. The player has the choice to fold or make a raise bet. The raise bet must be two times the ante bet. If the player folds he will lose his ante bet and his cards will be collected. 6. The dealer will turn over the player's community card and his own three cards dealt face down. 7. The dealer needs three suits or higher to qualify. 8. If the dealer does not qualify, then the ante bet will pay according to the pay table in table 2, and the raise will push. 9. If the dealer qualifies and the player beats the dealer then the ante bet will pay according to the pay table in table 2, and the raise will pay 1 to 1. 10. If the dealer qualifies and the dealer beats the player then the ante and raise bets will lose. 11. If the dealer qualifies and the player and dealer tie then the ante and raise will push. 12. The side bet will pay according only to the player's hand. Three possible pay tables for the side bet are shown in table 3. Last edited by MrCasinoGames®; 17th October 2014 at 07:07 PM. Mr Casino Games® will be at G2E with Lucky-Draw Baccarat® in TCS-JohnHuxley Booth. Mr Casino Games® will be at G2E with Lucky-Draw Baccarat® (Play in UK and Australia) in TCS-JohnHuxley Booth. P.S. Mr Casino Games® will also have a set of 8 New Table Games with him (2-Roulette, 1-Blackjack 2-Baccarat and 3-Poker). Last edited by MrCasinoGames®; 17th October 2014 at 07:08 PM. Casino Hold'em® Free app for iPhone, iPad and iPod touch, Released: Feb 25, 2014. Mr Casino Games® (Casino Hold'em®) Free app for iPhone, iPad and iPod touch.. (This app is optimized for iPhone 5) Released: Feb 25, 2014. How to Play Casino Hold'em® (DEQ). First Texas Hold'em Against the Casino ©2000. Last edited by MrCasinoGames®; 17th October 2014 at 07:10 PM. Mr Casino Games® Set of New Table Games at G2E. 1. Lucky-Draw Baccarat® at TCS-JohnHuxley. Play Live in UK and Australia. How to Play. Maths & Countability. 2. Casino Hold'em® at DEQ. Played On-line and Live. For Fun on any Device. Free app for iPhone, iPad and iPod touch. How to Play. 3. Raise'em® 3-Card Draw® Played in UK. How to Play. 4. Trip Cards® Draw-Poker® Played in UK (Hot). How to Play. 5. Roulette-18® Played in UK (Hot). How to Play. 6. Face-Up Casino Hold'em® (Casino Hold'em® Dealt Face-Up). Last edited by MrCasinoGames®; 14th September 2014 at 08:40 PM. Live Casino Hold’em® at Full Tilt Live Casino. 15/09/2014. The most popular poker game in the world – casino style. Live Casino Hold’em sits you across from a dealer as you both try to make the best five-card hand. No bluffing, no complicated maths – just cards, chips and intuition. Read More. Casino Hold'em® Free App for iPhone, iPad and iPod touch.. (This app is optimized for iPhone 5) Released: Feb 25, 2014. Live Casino Hold'em® at 888Casino.com. Casino Hold'em® an exciting poker game where you play against the house, not other players! With payout odds of up to 100:1 your aim is to beat the dealer’s hand by getting the best possible five-card hand. Read More. 2. Lucky-Draw Baccarat® at TCS-JohnHuxley. Play Live in UK and Australia. Maths & Countability. How to Play. Mathematical Analysis: Cindy Liu. 3. Raise'em® 3-Card Draw. Played in UK. How to Play. Mathematical Analysis: Stephen How. 4. Trip Cards® Draw-Poker. Played in UK (Hot). How to Play. Mathematical Analysis: Cindy Liu. 5. Roulette-18® Played in UK (Hot). How to Play. Mathematical Analysis: Stephen How. 6. Face-Up Casino Hold'em® (Casino Hold'em® Dealt Face-Up). Mathematical Analysis: Stephen How. 7. Bacca® (New). Mathematical Analysis: Cindy Liu. 8. 2+1® Hold'em (New). Mathematical Analysis: Stephen How. 9. Pai-Gow Baccarat™ (New). Mathematical Analysis: Stephen How. 10. Tax-Free Baccarat™ (New). Mathematical Analysis: Charles Mousseau. 11. Automatic-Win Blackjack™ (New). Mathematical Analysis: Charles Mousseau. 12. Jackpot-Streets Roulette™ (New). Mathematical Analysis: Charles Mousseau. Last edited by MrCasinoGames®; 17th October 2014 at 07:12 PM. Top Draw Blackjack® ©2010 (Mr Casino Games®). (Mr Casino Games®) Top Draw Blackjack® ©2010. 1. Each Player makes an Enter-bet and an optional Bonus-bet Contrast Bonus™. 2. Dealer deals two cards face up to each Player one card to himself face down. 3. Each Player has the option of changing his second card if his first two-card make a hard total of 12 or higher by making a Draw-bet which is equal to his Enter-bet. 4. After the changing option the hand is played as normal (Stand, Hit, Double-down or Split). 5. After all Players have acted; the Dealer deals a second card to himself and changes that card for a new card from the shoe if his two-card point total is a hard 12-17. 6. The Dealer hits until his hand total reaches 17 or higher. · If the Player wins then all his bets wins. · If the Player lose then all his bets lose. Last edited by MrCasinoGames®; 17th October 2014 at 06:54 PM. (Mr Casino Games®) Trip Cards® Holdem. ©2006. 1. Each Player makes an Ante-bet and an optional Bonus-bet. 2. Two cards are dealt face down to each Player and the Dealer, in addition one community-card are dealt face up in the middle of the table. 3. Each Player examines his cards and must either Fold or stay in the game by making a Call-bet which is double his Ante-bet. 4. The dealer will deal two more community cards, for a total of three. 5. Both player and dealer will make the best three card poker hand using any combination of his own two cards and the three community cards. 6. Dealer compares his 3-card poker hand with the Player’s 3-card poker hand. The Dealer qualify with a pair of seven or better. • If the Dealer does not qualify then the Ante-bet will pay according to the AnteWin® Pay-table and the Call-bet will push. a) Player beats the Dealer then his Ante-bet will pay according to the AnteWin® Pay-table and the Call-bet will pay 1 to 1.
b) If Dealer beats the Player then the Player will lose his bets. c) If Dealer and Player tie then the bets will push. Last edited by MrCasinoGames®; 17th October 2014 at 06:57 PM. Read More on Mr Casino Games® Roulette-18® Exclusive with TCS-JohnHuxley. Last edited by MrCasinoGames®; 24th March 2015 at 10:29 AM. Mr Casino Games® Progressive Games. Mr Casino Games® Progressive Games: (Casino Holdem® Progressive, Raise'em® Poker-Progressive and Block Pro® Blackjack-Progressive...) are play on TCS John Huxley GFL Bonusing system (a floor-wide Progressive) in South African 100+ Tables. More Progressive Games to come for GFL Bonusing system in 2015. (Read More on TCS John Huxley GFL Bonusing system, a Floor-wide Progressive). TCS John Huxley GFL Bonusing system (Floor-wide Progressive). Last edited by MrCasinoGames®; 24th March 2015 at 09:58 AM. Live Dealer Casino Hold’em® with Evolution Gaming / Turn over 1,000,000,000 Euro in 2014. Casino Hold'em® Poker is the Number-1 Online-Casino Poker-game (First Texas Hold'em against the Casino ©2000). Last edited by MrCasinoGames®; 13th April 2016 at 02:41 PM. Last edited by MrCasinoGames®; 17th January 2015 at 11:36 AM. Mr Casino Games® Progressive Games on TCS John Huxley GFL Bonusing system. Mr Casino Games® Progressive Games: (Casino Holdem® Progressive, Raise'em® Poker-Progressive and Block Pro® Blackjack-Progressive...) are play on TCS-JohnHuxley GFL Bonusing system (a floor-wide Progressive) in South African 100+ Tables. More Progressive Games to come for GFL Bonusing system in 2015. 5-Card Poker-Progressive, Baccarat-Progressive, Blackjack-Progressive and Casino Hold'em® Progressive on TCS John Huxley GFL Bonusing system (a floor-wide Progressive). Play live in South Africa 80+ tables. Mr Casino Games® 5-Card Poker-Progressive. Last edited by MrCasinoGames®; 6th February 2015 at 05:32 PM. Mr Casino Games® LIVE DEALER Casino Hold’em® from Microgaming's LIVE DEALER Studio.